The Roman Forum, is now a major tourist attraction, it starts near the Colosseum and continues all the way to Piazza Venezia. This is a large and complicated site, and in a much ruined state, to get the most out of your visit, it is advisable to read up a little on what is there to be seen. To help find your way around, go armed with a good map. The forum is the place where public meetings were held, important announcements made, and where famous orators would speak. Forums could be found in every city in the Roman Empire. 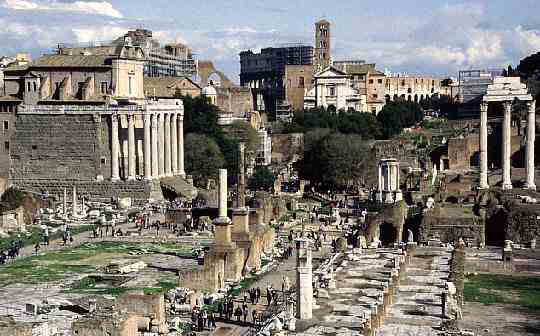 Rome itself had more than one forum, but only the first forum was called Forum Romanum, or Roman Forum. Emperors recognizing the social importance of the forum, would build new ones in their own honour. Originally the area on which the Roman Forum is built was a swamp, the area was used as a cemetery by the people who lived in nearby villages. During the 6th century B.C. the Etruscans who were the first kings of Rome, unified all these villages into the city of Rome, they drained the marshes, and soon, shops and temples were being built. But, it was during the 2nd century B.C. that the merchants and their shops were moved to other parts of the city, and the Forum became the civic and legal centre of Rome. Some of the major attractions to be explored are, the Arch of Septimius Severus, which is one of the best preserved structures in the Forum, it contains the remains of an inscription to Septimius and his two sons, Caracalla and Geta. 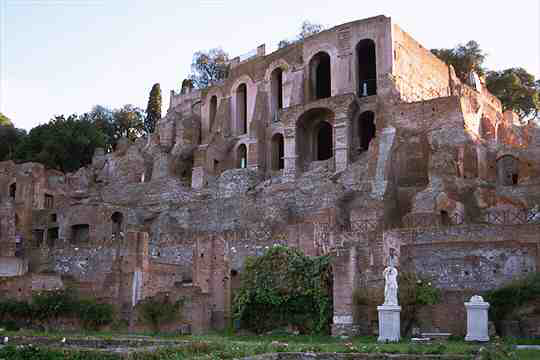 The Rostra, which was used for public speaking, and was the place where Mark Anthony delivered his speech after the assassination of Julius Caesar. There are the brick remains of the Senate building, known as the Curia. The Basilica Aemilia, where taxes were collected. The Temple of Julius Caesar, that was erected to his memory by the emperor Augustus. Then there are the three remaining columns from the Temple of Castor and Pollux, which is the oldest temple in the Forum, dating from 484 B.C. Other major ruins include, the Temple of Romulus, the Temple of Saturn, the Temple of Vesta, the Temple of Venus and Roma, the Basilica Julia, the Arch of Titus, the Basilica of Maxentius and Constantine, and the Tabularium, which was where all the official records were kept.